Collagen is the most abundant protein in the human body and the main protein that makes up the extracellular matrix in our tissues, i.e. the “bulk” of our tissues. It is a so-called fibrillar protein, in that the collagen molecules self assemble into fibrils, and these fibrils are critical to both the tissue’s biological and mechanical roles. The collagen fibrils act as a scaffold, both supporting the cells in the tissue and providing tracks for them to move along when they need to move to a site of injury, for instance. They are integral to the communication system between the cells and along with the other extracellular components of our tissues, they make up the material from which the various structures in our body are made. Collagen is naturally glycosylated. That is, the collagen protein molecules have sugar molecules covalently bonded to them (to lysine and hydroxylysine residues). The purpose of this glycosylation is unknown, but without it, the collagen molecules do not form structural fibrils. We think that one role of the sugars is to provide a low energy interface between the collagen fibrils and surrounding aqueous medium of the tissue. Collagen is a largely hydrophobic molecule (water repelling), whilst sugar molecules generally have a hydrophobic and a hydrophilic face. 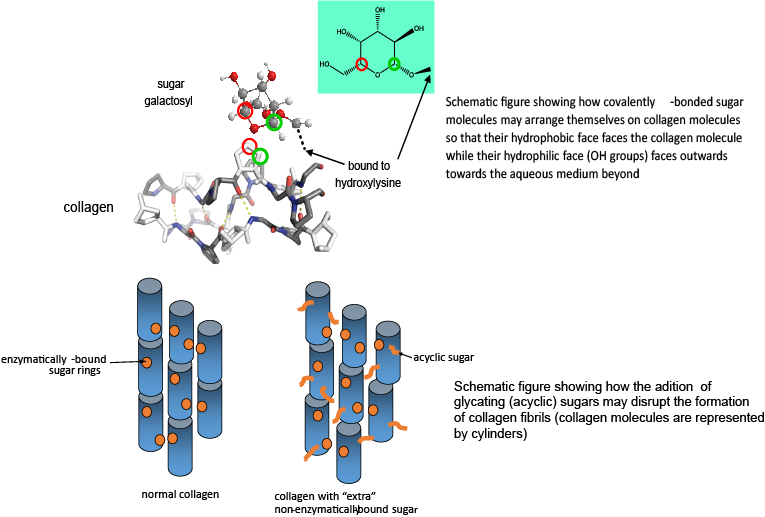 If the sugar molecules bound to collagen are arranged so that their hydrophobic face is against the hydrophobic collagen (fibrils) and their hydrophilic face points outwards to the aqueous medium beyond, the disruption to the surrounding water molecules imposed by the presence of a collagen fibril is much less, and the interfacial energy between collagen fibril and surrounding water is much more favourable than without the presence of sugar. Unfortunately, collagen can also acquire covalently bound sugar that is not supposed to be there – so called glycation – the non-enzymatic covalent addition of sugar molecules. This is known to occur in the tissues of diabetics, for instance, where the background level of sugar in the tissue is excessively high. Over time, the glycating sugar reacts further, forming so called advanced glycation endproducts or AGEs. There are many AGEs that consist of cross links between collagen molecules. This has the effect of stiffening the tissue and is probably a major cause of the tissue stiffening we associate with ageing. However, there are very likely to be other severe consequences – binding collagen molecules together forces them to have a fixed orientation with respect to each other, and ultimately affects how they are assembled into fibrils. In turn, this will affect what the surface of the collagen fibril looks like. Cells “recognise” their homes on the collagen matrix by what chemical functional groups are on the surface of collagen fibrils, and if this changes, it is very likely to change how the cells behave. We are currently researching the early stages of collagen glycation – what happens to the functionality of the collagen both in terms of its mechanical properties and in terms of how cells react to it when sugar molecules are non-enzymatically added, but before they have had time to react further. We suspect that the simple addition of sugar molecules where they should not be will affect how collagen molecules are assembled into their fibrils, which in turn will affect how strong they are mechanically and how cells react to them. In areas of chronic inflammation, dying cells release a variety of sugar molecules. Very recently, we have discovered that some of these are very reactive in glycating collagen and may cause considerable long term damage in the tissue. More on this in the near future….